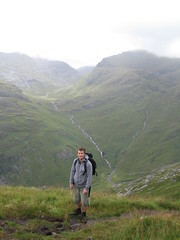 Ring of Steall - not! 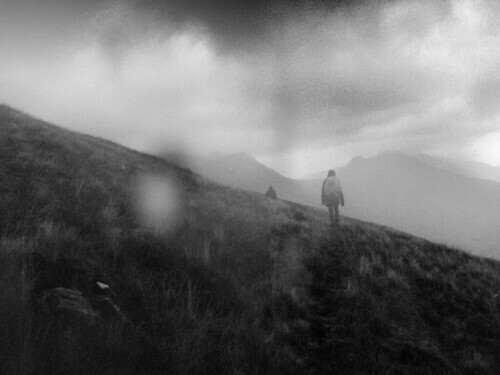 A mini-arc of the Ring of Steall, Mamores - or - Welcome to the Western Highlands! 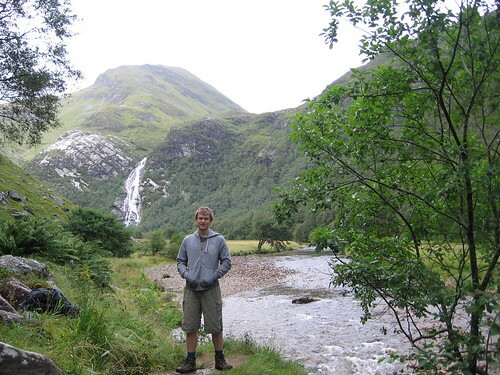 This was really an after-thought, to attach a munro walk to a visit to Glen Nevis, the naming-place of our first son (a beautiful picture of it out of a Scotsman Calendar was our inspiration). We even brought him along, now 22 years old and keen to see the place after which he was named. And as we found, Glen Nevis really is a beautiful place, and Steall Falls and the gorge of the Water of Nevis both quite spectacular. So the plan was to visit the Glen and then continue up onto An Gearanach, proceed clockwise down and up and exit north west off Sgurr a'Mhaim, with a potential bombing-out before the Devil's Ridge if required. It was straightforward enough making our way from the carpark up along the gorge to the three-wires (I was going to ask why they weren't joined so as to be more stable, and then I realised you could possibly slide a carabiner along them as they are). Carefully sploshing through the mud either side of Steall Falls was fun and a fairly easy acent was made up the zig-zaggy stalkers path. A quick snack was had in the grassy spot below An Gearanach, enjoying the patchy (due to rain) view up the Glen, in the lee from the South Westerly that was getting stronger. By the time the snack was finished, rain had begun, and the wind had freshened. 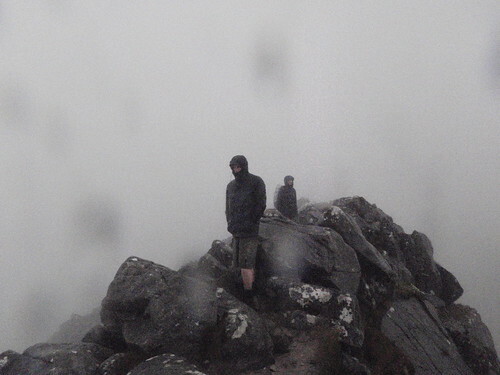 By the time we got to the top of An Gearanach, it had blown in fierce, and whilst visibility wasn't bad, being able to look up to actually see was problematic, due to the icy wind. Hadn't considered snow goggles for this trip! Even after the simple traverse to An Garbhanach, it had been so blustery and sleety that aforementioned son asked how much more we were going to do. Taking the hint, and realising that we had at least another hour of walking into the sleet if we continued, we decided to bail east and anti-clockwise, making our way north high above the Allt Coire na Gabhalach, sometimes on an old bench track, continuing on above some ten or so deer, and skirting above the An Cearcallach to join the original track as it dropped down to the Nevis valley again. Passing below the Steall Falls this time was quite spectacular, as the volume had doubled, perhaps tripled on what we had passed only two or three hours earlier. Helen and I had to link arms on our crossing, and the stream bottom was only barely visible (we figure that if you can see the bottom, you're probably okay - that's a rule of thumb we've used in NZ before, anyway). The Water of Nevis thundered through the gorge, leaving us not disappointed, but impressed. So the day was not what we - as naively optimistic Aussies - had hoped, but actually still had an interesting and beautiful trip, and learnt much about Highland weather. Last edited by AndrewP on Sun Sep 27, 2009 2:44 am, edited 1 time in total. 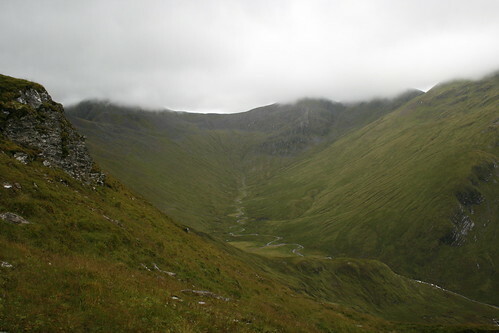 Re: Ring of Steall - not! Nice report and especially like the pic of the Garbhanach 'tent-ridge' as I call it - I had to turn back at An Garbhanach when I crossed from An Gearanach as I didn't like the last bit so it's not that simple! And yes, there's lots and lots to learn about Highland weather (or any British weather for that matter) - none of us can figure it out, especially how we never get summers any more! 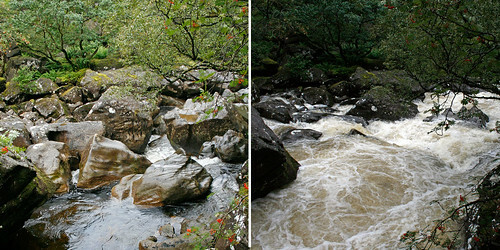 That's an impressive difference in the volume of the falls between the first and the last pic- I've never seen it quite like that! 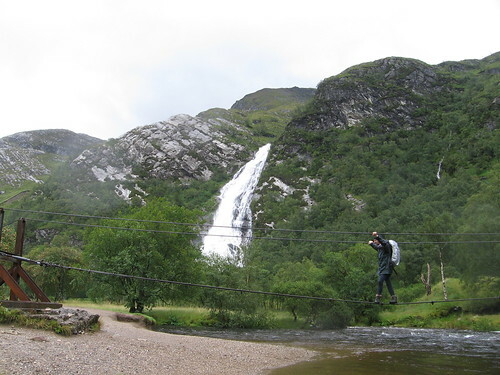 That wire bridge is great fun! Last edited by AndrewP on Sun Oct 11, 2009 6:18 am, edited 1 time in total. Just in case it helps anyone else bail out...! Hard luck with the weather Andrew,it took me 3 visits to get the Ring of Steall done as the weather was so bad on the first 2 attempts! Yeah, well, I intend to come back some time. Very impressive comparison in water flow there.